Seven Must-Have Accessories That Will Keep The Garage Clean! Trying to keep your garage clean and organized may not happen overnight, but if you are willing to invest in a few accessories you will be able to make a huge difference and feel good going out into that space. You might even be able to fit the car inside! Check out these SEVEN great garage organization ideas! If you really want to take advantage of all the space in your garage then don't forget about the ceiling! This would be the perfect spot to store seasonal things or things you don't need very often. If you keep them in bins like the above picture then they won't get dirty either. This keeps rarely used items off the floor. This are an affordable way to get things off the floor. 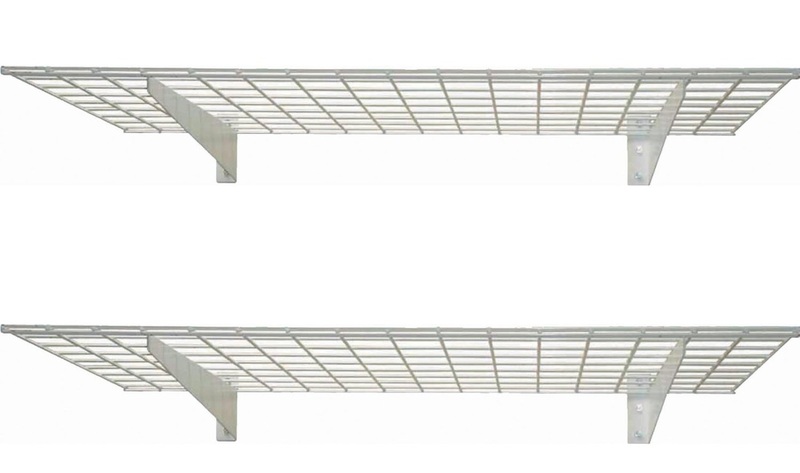 These shelves are metal and heavy duty. The are attached to the studs in the wall and can take a lot of weight. You could put smaller items in tubs and then store them on these shelves for safe and clean keeping. 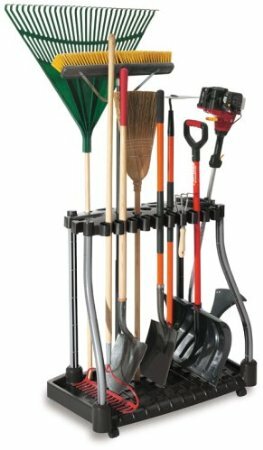 This is the perfect accessory for keeping everything from garden tools to shovels neatly arranged instead of all of the floor or leaning against the wall. it is easy to get at and just keeps things organized. Bicylces can be one of the worst culprits when it comes to a messy garage! 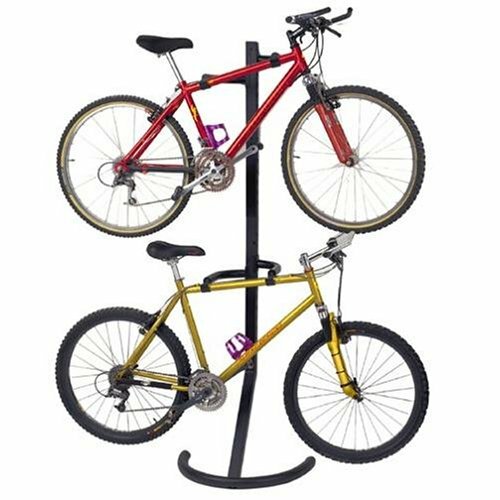 By purchasing a bike stand such as the one pictured will get the bikes off the floor and put away. 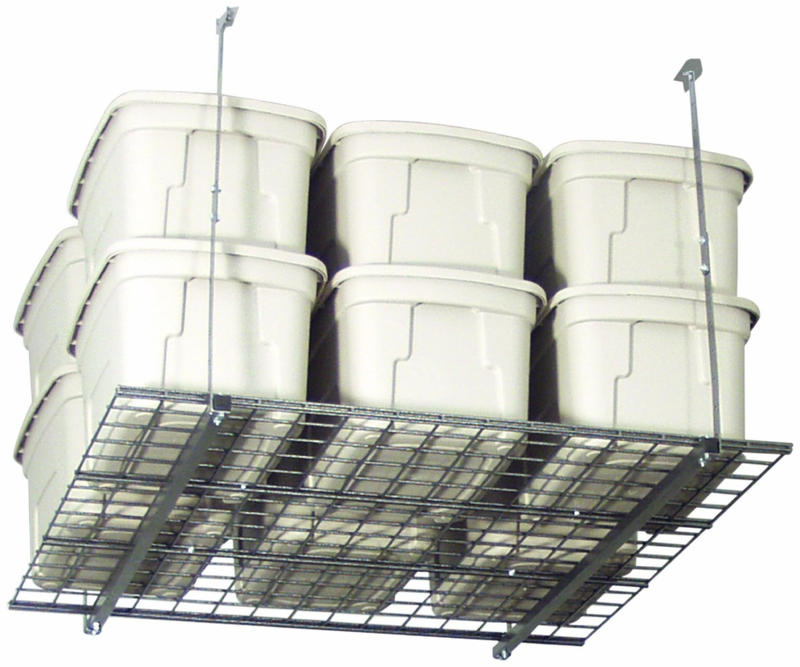 This particular storage system utilizes the ceiling to get the bikes off the ground, out of the corners and away from the walls. Our bikes ended up out in a damp shed or under a tarp simply because they were a pain to store, so this system is like a sliding filing cabinet on the wall making it easier to get one out for the day or to put away and end of ride. I wrote more information on this ultimate bicycle storage system. Click here for more information. If sports equipment ends up all over the floor in your garage or worse, all over your work bench then consider getting a bench with sports equipment storage. They can sit on the bench to put on their shoes and it is an easy place to put all their sports accessories for the whole family. 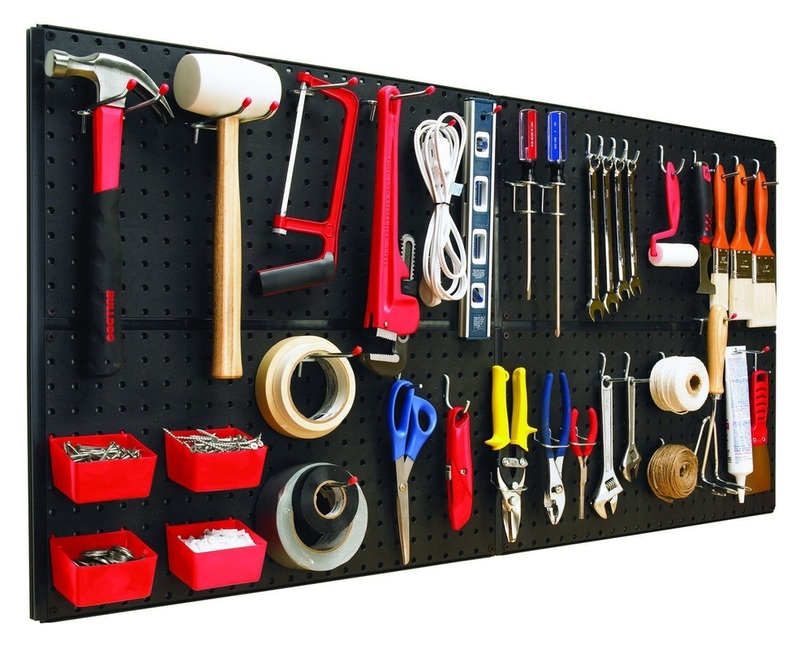 If you want to have all your tools right in front of you, then consider a peg board system which will hold all your tools and even little bins for smaller items. This is a great way to stay organized and not have to search through tool boxes. It easily attaches to the wall. These cabinets are fantastic for storing tins of paints or solvents or other things you may want to keep off of the bench. It will keep things dust free and it will hold a lot of products. You may find that this is all you need to really organize your garage. Another option, if you simply can't fit anything else in your garage is to consider a Portable Garage Shelter these are a great alternative to a permanent shed or garage and could save you on storage fees if you have been renting storage units. We use one of these shelters as we rent and can take it with us when we leave. 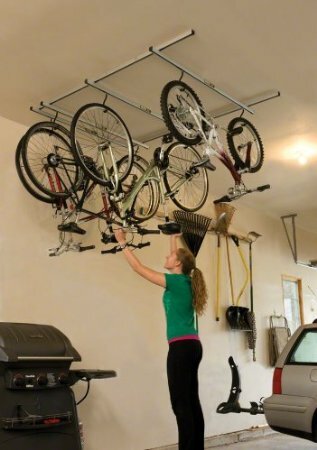 If bicycle storage is your main concern also see the ultimate in storage utilizing your ceiling. Saris Cycle Glide Ceiling Bicycle System.